The firm expects 21.5 million convertibles sold by the end of 2015, or 70 percent more than the previous year. Analytics firm Gartner, Inc. have revealed that the firm expects hybrid devices to really take off by the end of this year to become the fastest-growing segment in mobile computers. 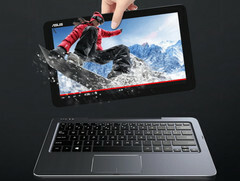 Its forecasts separate tablets and very slim and lightweight clamshells from convertibles and detachables. Thus, the firm focused on the latter types of notebooks where multiple forms come standard. Accordingly, Gartner expects global sales of these hybrid devices to reach 21.5 million units by the end of 2015 for an increase of 70 percent over 2014. This would account for 12 percent of the mobile PC market share is expected to reach 26 percent by 2019. Of the 21.5 million hybrid PCs, 13.5 million are predicted to be 2-in-1 convertibles and the other 8 million to be detachables. A survey of 21000 users across Brazil, China, Germany, India, and U.S. concludes that 11 percent, 10 percent, and 8 percent of desktop, tablet, and notebook users, respectively, will eventually become hybrid PC users in the next two years. The most successful hybrid manufacturer of 2014 was Asus with 41 percent of the convertible market share. This translates to 3.1 million hybrid Asus models sold and 15 percent of all notebook shipments from the manufacturer. Lenovo was a close second at 1.9 million hybrid units sold and HP third with 0.8 million sold. The ultramobile tablet PC market was dominated by the Microsoft Surface and its optional keyboard stand.